For the past 8 months I’ve been helping to plan an event called “The Art of Food.” Last Wednesday night (5/27) was the big night. 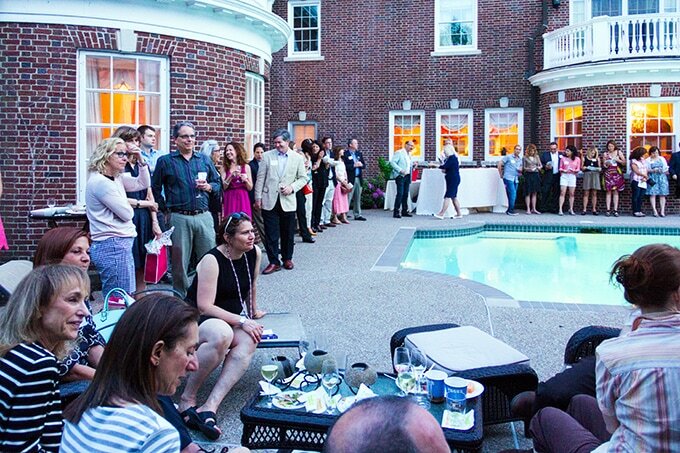 100 guests turned out at a beautiful private home in Newton, MA, to meet and mingle with four of Newton’s star chefs and to enjoy an evening of food and wine and friends and neighbors. The event was part of The Newton Festival of the Arts. The festival spanned the month of May and offered over 60 artsy events. 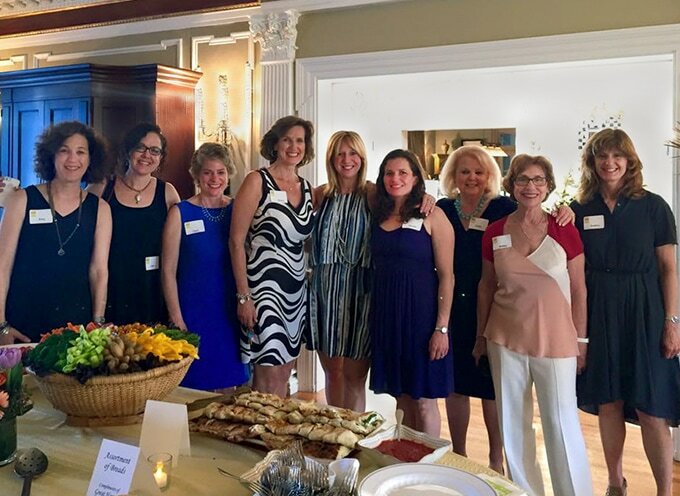 The goal was to bring the community together to enjoy and celebrate our very own Newton artists, and at the same time to raise funds for Newton arts and cultural organizations and local food pantries. 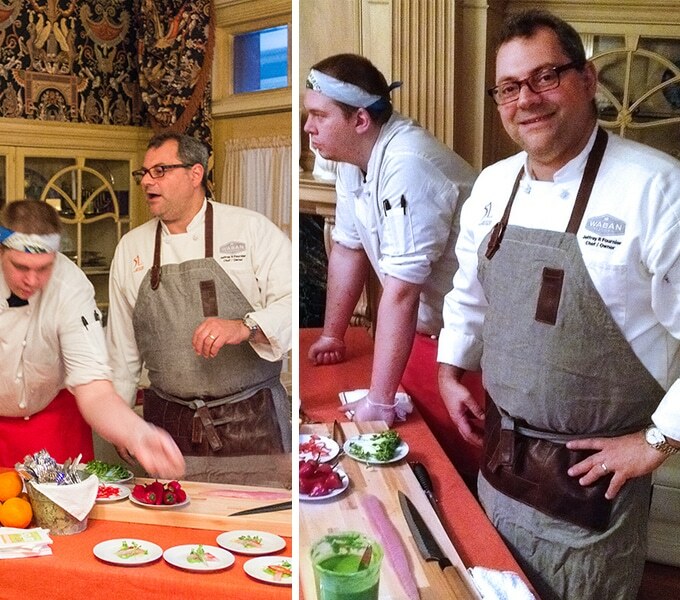 Meeting the chefs was great! 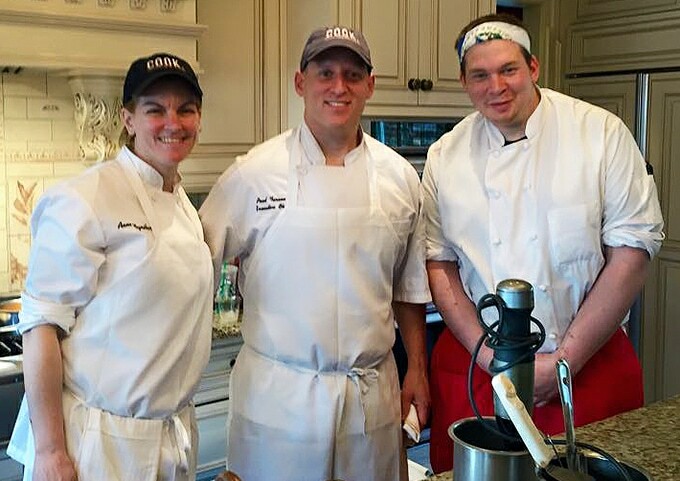 I have a thing for chefs – don’t we all? 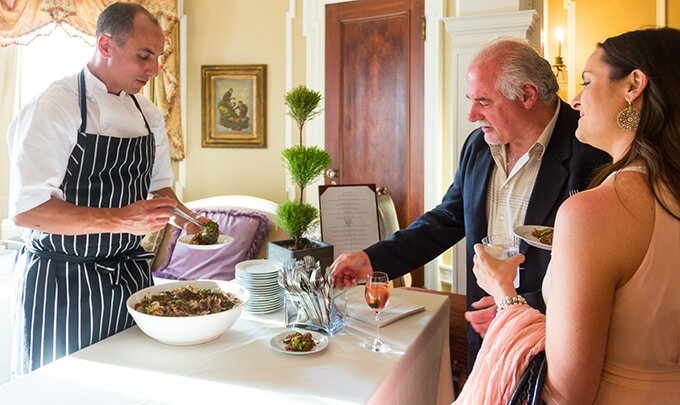 They make us happy with their delicious food and drink, and the wonderful ambiances of their restaurants. Dining at great restaurants is one of my favorite things to do in life but I rarely get behind the scenes to meet the chefs that create all the magic. 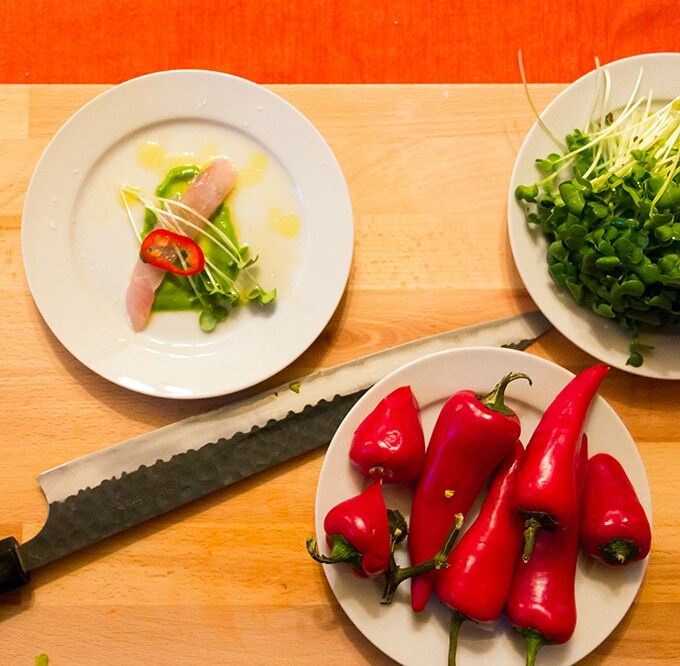 Serving: Spanish Mackerel Crudo with Olive Oil, Chilis, and Pea Puree. 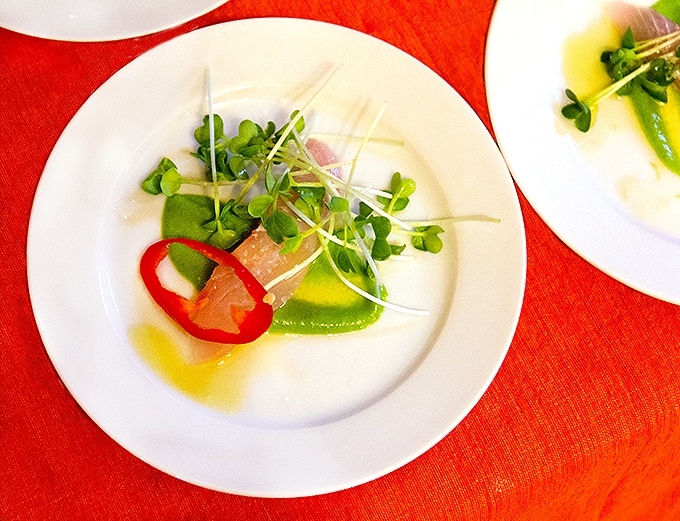 The crudo was spectacular – so fresh, and deliciously paired with creamy sweet pea puree, a thin slice of chili pepper for a perfect touch of heat and crunch, and a drizzle of olive oil and a sprinkle of salt to pull it all together. Jeff Fournier is a fine artist/painter in addition to being a chef. His knowledge of color and composition definitely shows in his plating! 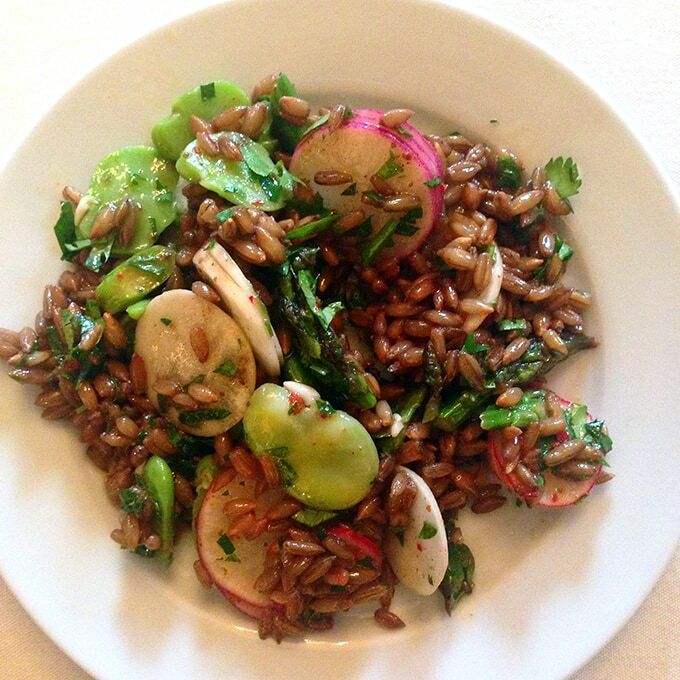 Serving: Rye Berry, Fava Bean and Turnip Salad with Sumac Vinaigrette. 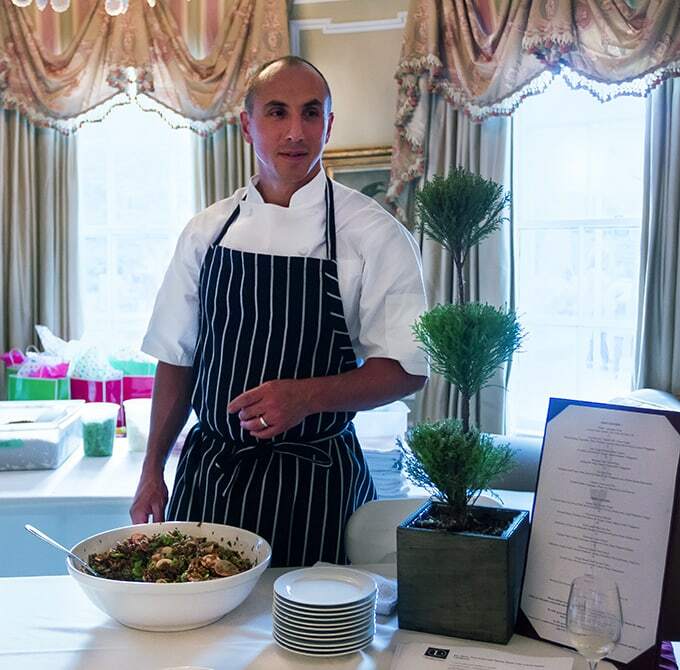 Chef Leviton’s Rye Berry salad tasted like spring: a bowl of chewy, nutty rye berries, bright seasonal vegetables – turnips, favas, radishes, asparagus – with fresh herbs, olive oil and lemony sumac. I loved every delicious, healthy bite! 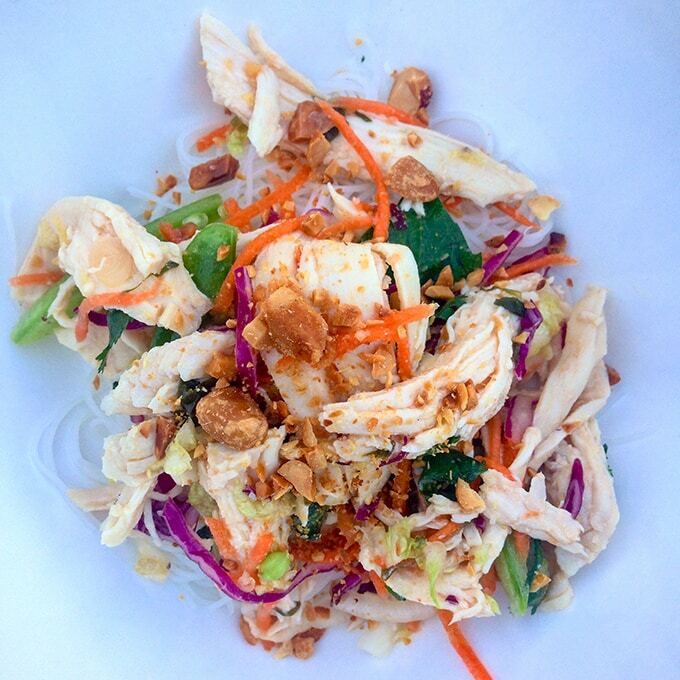 Serving: Southeast Asian Chicken Salad with Glass Noodles. Chef punch’s salad was an explosion of flavor – some heat, some sweet, some tang, soft slippery noodles, crunchy vegetables and peanuts – lots of excitement in every bite! I can’t wait for Chef Punch’s new East Asian soul food restaurant “Little Big Diner” coming soon to Newton! 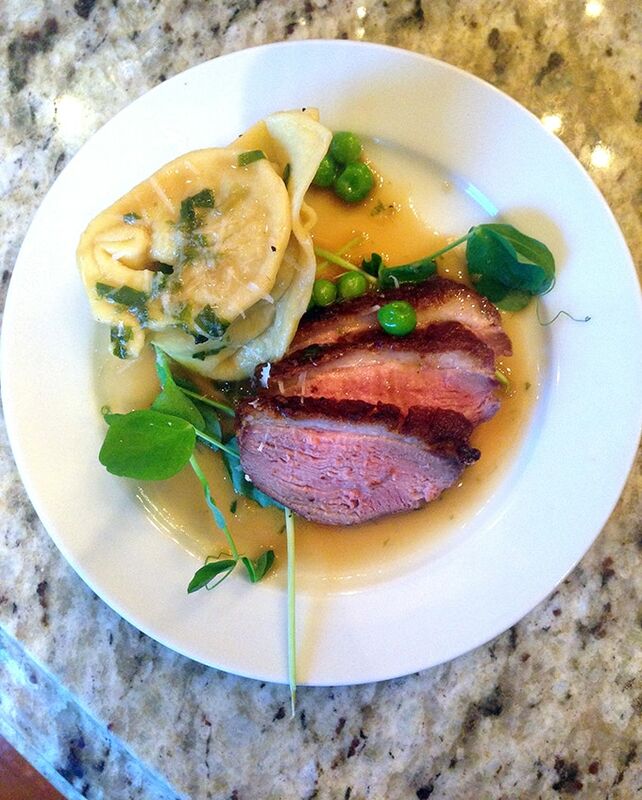 Serving: Roasted Duck Breast, Duck-Filled Ravioli, Pea Vines and Ramp Butter. This dish was so luscious I could have eaten 10 of those little plates! I hope Chef Turano will put this on the menu at Cook! After dinner there was an informal forum with the chefs out by the pool. 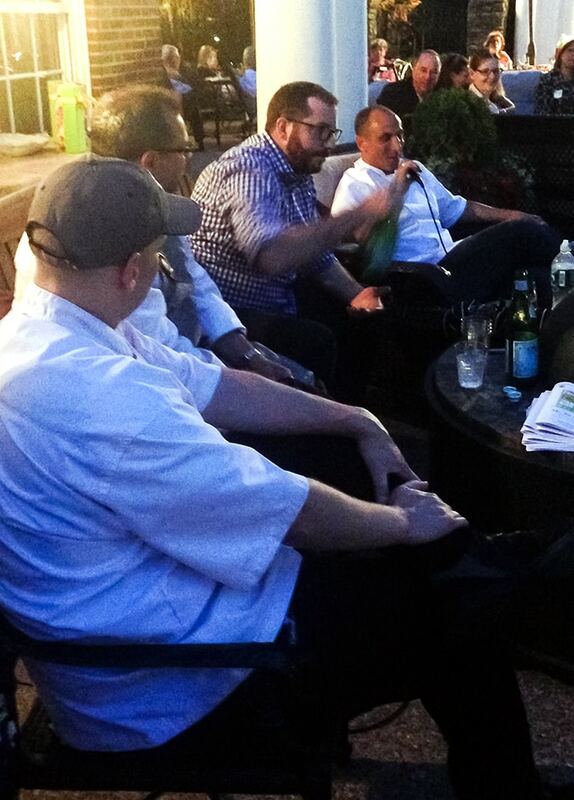 Our event chair, Denise Swidey, threw some questions out and the Chefs passed around the mic. 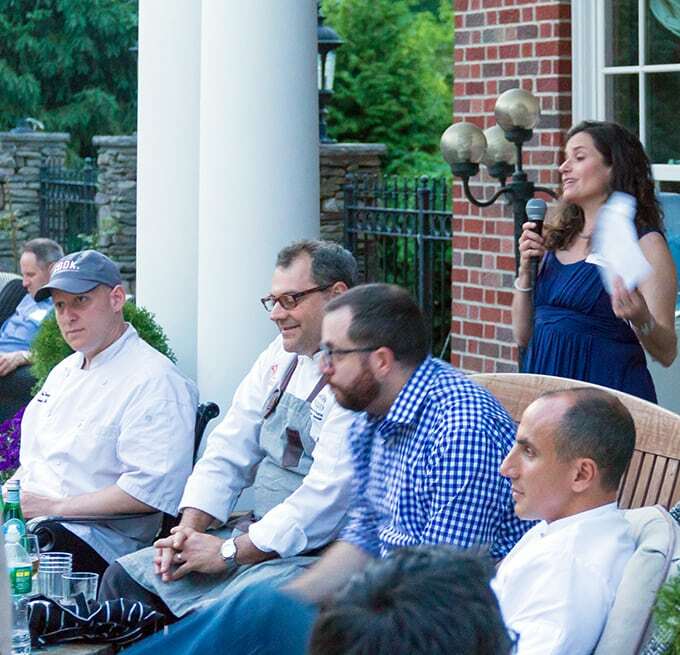 The more heavy topics were about art and allergies: Most of the chefs expressed that what they do doesn’t have much to do with art – they said that being a chef is better described as a craft that requires technique and consistency. Chef Fournier was the only one who said that color, composition and negative space come into play with his food presentation. All four chefs agreed that the biggest challenge they face on a regular basis is accommodating people’s allergies and intolerances – one person with an allergy can mean a total stand-still in a busy kitchen. Lots of laughs as some charming personal stories emerged – Paul Turano wanted to be a chef from the time he was 5; David Punch related memories of his mom’s rotten baked scrod as his inspiration for starting to cook in high school; Michael Leviton’s first serious meal he made was Thanksgiving, including a very memorable cranberry maple pear pie; Jeff Fournier would have also been happy being a famous painter…. It was a fun night and by all measures a great success. Here’s my amazing committee plus our hostess, in the middle. I’m happy to have this post as a memento of a great event. I hope you enjoyed it too. 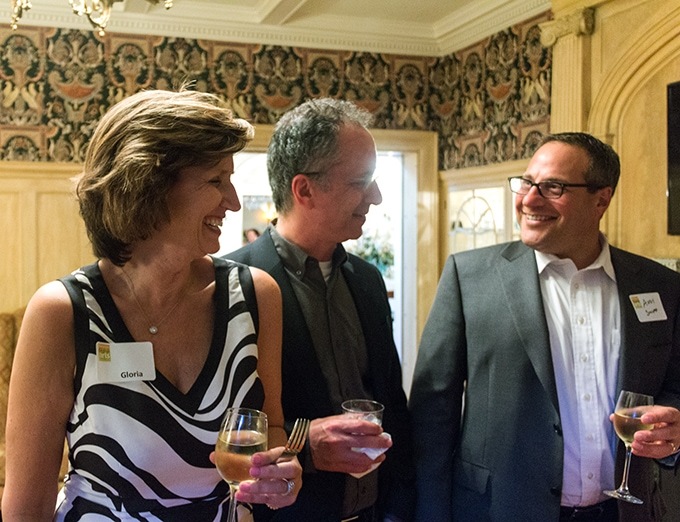 Lisa, this looks like it was a fabulous fun event! I’m sorry we weren’t able to be a part of the event this year, but will definitely plan on it for next year. Congratulations to you and your committee! Well done! As a Newton resident, and owner of Gubba Gold Rum and Gubba Silver Rum, I am so sorry not to have known about this event. I would have loved to have been able to participate with you. Perhaps there will be other opportunities to do so. I’m so sorry you missed it! 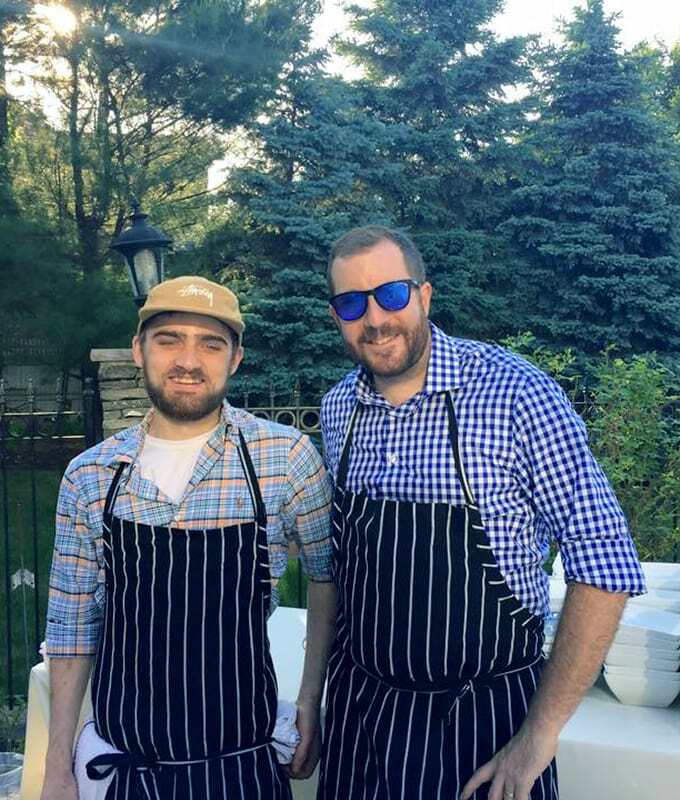 I’m sure there will be many other great Newton foodie events that you can participate in!